Hide your entire WooCommerce store, while keeping the rest of your site public. Hide your WooCommerce content behind one or more simple passwords. Customers can enter a password to access the store. Automatically unlock WooCommerce when someone logs into their user account, while keeping it hidden from guests. Need to Protect WooCommerce Categories? The Private Store plugin hides your whole shop. If you want to sell public and private products or sell different products to each customer, get our WooCommerce Password Protected Categories plugin instead. The plugin hides the main WooCommerce shop page, cart, checkout, products, categories, tags, etc. Supports multiple passwords. Protect your private WooCommerce shop via a customisable password entry page. Customers can enter a password to unlock the entire shop. No need for separate user accounts. As well as password protecting WooCommerce, you can automatically unlock the store for logged in users. Guests can see your main pages while WooCommerce remains hidden. WooCommerce Private Store password protects all your shop pages plus navigation menu links and sidebar widgets. Your WooCommerce hidden store is automatically hidden from search engines and sitemaps. No one will know you have a WooCommerce shop unless you want them to! The WooCommerce Hidden Store plugin is developed and supported by top UK WordPress agency Barn2 Media, est. 2009. We'll help you make WooCommerce private in no time! Rated 5 out of 5 stars based on 19 customer reviews. Perfect solution for B2B, client-access only WooCommerce stores! Super fast install and setup, works like a charm. Store was instantly hidden across the entire site, and then upon plugin deactivation came right back up. Hide your store in under 5 minutes. 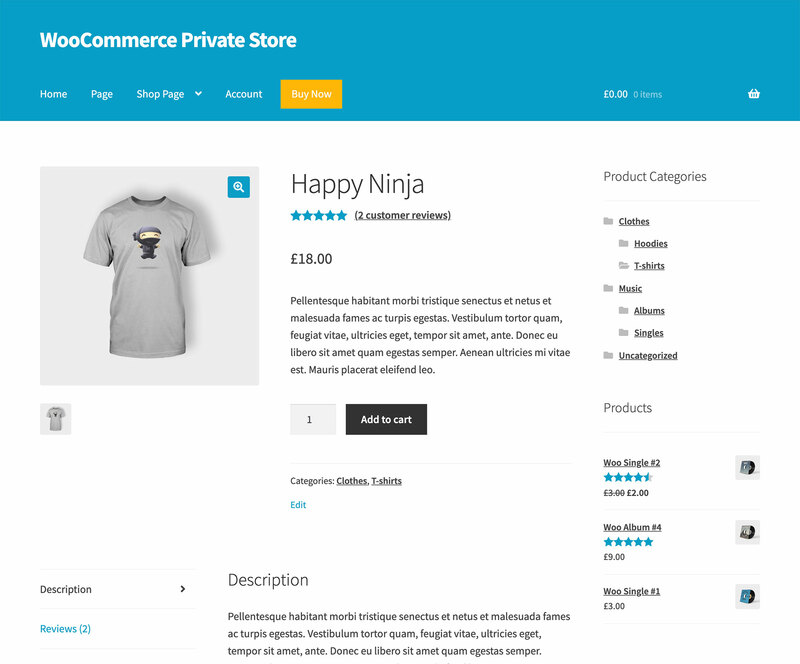 Buy the WooCommerce Private Store plugin today! How does the plugin work? The WooCommerce Private Store plugin password protects all the pages within your WooCommerce online store. The rest of your WordPress site remains public - e.g. your homepage and other pages. However the WooCommerce elements - your main Shop page, products, categories, product tag archives and the cart and checkout are password protected and hidden from search engines. Will anyone know my private WooCommerce store exists? Only if you want them to! If you like, you can link to your private store from the menu or anywhere else on your public website (e.g. a 'Wholesale Login' link in the header). When people click it, they will be taken to the WooCommerce login page where they can enter a password. Or alternatively, you can keep your WooCommerce store completely hidden with no public links to it. The only way people will know it exists is if you give them the link. How does the password protection work? You can make WooCommerce private by activating the plugin and setting 1 or more passwords. All WooCommerce pages will be protected. Customers must enter a correct password to unlock the private WooCommerce store. Customers only need to enter the password once to access the entire store. Can I have a separate private WooCommerce shop for each user? No - WooCommerce Private Store protects your entire store. Once customers unlock it by entering a correct password, they will have access to your whole WooCommerce shop. To create user-specific private areas with different products for each user, you can use our other plugin WooCommerce Protected Categories. This lets you create a separate protected category for each user. Will my products be hidden from search engines? Yes, the WooCommerce Private Store plugin hides all parts of your online shop from search engines and the WordPress search on your site. This includes your shop page, product pages, category pages, tag archives etc. Can my WooCommerce store have public AND private areas? The WooCommerce Private Store plugin hides your entire shop (but not your normal WordPress pages and posts). To create separate public and private areas in WooCommerce, you'll need our WooCommerce Password Protected Categories plugin instead. We have tested WooCommerce Private Store with a range of free and premium themes and are confident it will work with your theme. If you have any problems (e.g. a cart icon showing in the header), get in touch and we will be happy to add further support for your theme. Will it work in my language? The WooCommerce Private Store plugin is 100% certified as being compatible with WPML, the world's leading WordPress multilingual plugin. This makes it easy for you to translate it into other languages. You’re buying a plugin product from us, but it comes backed by our service: we work to continually add new features, important security updates, and efficient customer support. We thus use annual subscriptions to ensure we can continue bringing these benefits to you. Which versions of WooCommerce and WordPress are supported? The plugin is fully integrated and tested with the latest versions of WooCommerce and WordPress. Customers unlock the private WooCommerce store via a customizable login page. Unlocking the store gives access to all elements of WooCommerce - products, categories, cart etc. Customize the password login form, unlock WooCommerce for logged in users, and more. Buy WooCommerce Private Store and hide WooCommerce today. Remove account area and lost password page from protection when accessed directly. Account pages are still hidden in widgets and menus. Test with latest versions of WordPress and WooCommerce. Fix: Storefront theme - hide Cart and My Account links in footer on mobiles. Test with latest version of WooCommerce.